A train within SCP-2887, taken during initial exploration. Passengers observed with heavy bleeding from eye sockets. Special Containment Procedures: Owing to the volume of traffic utilising the building of which SCP-2887 is part, the site cannot be closed in its entirety. Instead, containment is focused on controlling access to SCP-2887. The office unit including the sole known access to SCP-2887 has been acquired by the Foundation on permanent lease with the assistance of the British government, and functions as the centre for operations not requiring access to SCP-2887. Access to SCP-2887 is restricted to those deemed necessary for its containment. Biosafety precautions consistent with US BSL-4 are to be followed at all times when inside SCP-2887, including, but not limited to, an airtight double door, redundant air-filtration systems and use of full-body protective suits. The interior of SCP-2887 is to be monitored at all times by self-contained closed circuit television cameras. Monthly entries into SCP-2887 are to be made in order to recover data from and change the batteries of the cameras as part of a general inspection, with spent batteries being recharged within SCP-2887 for future use. No equipment or other objects are to be brought out of SCP-2887; all surveillance data is to be transferred wirelessly to storage media within team members' protective suits. Otherwise, no entry to SCP-2887-A is permitted without both direct authorisation from both the Head Researcher and the ADC liaison officer attached to the SCP object. Any person directly exposed to the interior of SCP-2887 must be subject to a quarantine period of at least 30 days. Description: SCP-2887 is an underground chamber accessible through a door on a lower-floor service corridor of Charing Cross Station, located in London, UK. No other access points are believed to exist. 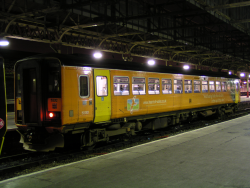 SCP-2887 has the appearance of a generic British Rail terminus circa 1970, with trains entering and exiting through tunnels at the chamber's far end. Exploration by remote drones has indicated that the tunnels are of indeterminate length. The volume occupied by SCP-2887 is inconsistent with the location of tunnels, utilities and basements in the surrounding area. Lights, plug sockets and other electrical equipment within SCP-2887 are all fully functional. Platform display boards identify destinations via strings of numbers and letters (believed to be hexadecimal codes) and identify the service operators as 'AWB'. This information is repeated by frequent loudspeaker announcements, apparently automated. SCP-2887 was brought to Foundation attention in 1993 via Project ELISION3. Containment was established following an initial exploratory mission by a Foundation containment team, with an ADC liaison in attendance. Under the terms of Project ELISION, containment of SCP-2887 is the sole responsibility of the Foundation; however, following Incident 2887-1, investigations are currently ongoing as to how ADC personnel became aware of the anomaly, and of any possible relationship with the organisation identifying itself as Anomalies Without Borders. SCP-2887-A at time of discovery. Internal lights have since failed. 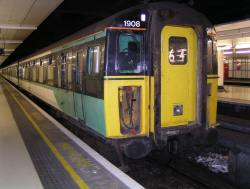 On ██/██/1996, a weekly inspection noted a train with its doors open. The train was boarded by the team, who found it empty, with the exception of a typed note pinned to the driver's door, a transcription of which is available below. Upon discovery, the driver's compartment was empty; a review of surveillance footage showed no signs of any exit from the train. The inspection team were subsequently placed in quarantine to protect against any potential contamination. Quarantine was relaxed after no signs of infection had occurred by 30 days after the incident. As a result of Incident 2887-1, inspections have been changed to occur monthly instead of weekly. The train containing the note has been present on all subsequent inspections, and has been designated SCP-2887-A. It has been proposed that notes may be left within SCP-2887-A as a method of communication. Approval for such attempts is currently awaiting O5 Council approval, pending further information on GoI-0188's involvement in SCP-2887. When we signed the agreement, you promised us you would not interfere with our activities. With regard to your recent activity within London Terminus, we remind you that AWB have full autonomy to conduct operations within the leased space. As you are no doubt aware, your reality is unusually stable for its .78 scoring on the Brown-Miliband Anomalous Scale; thus, use of your space allows our organisation to provide relief to literally thousands of universes with a relatively low risk of monoversal destruction. Thank to your generosity, we were able to aid seven million individuals from over fifty realities in the last annum alone; we hope that with your continued support, we will be able to continue our operations in future. I will also remind you that your co-operation thus far has granted you Priority Three status as per the contract; if you have any queries, please leave a reply in this unit and close the doors. 3. A long-term co-operation pact between the Foundation and GoI-0188, 1st Anomalous Defence Corps (ADC), the British military's dedicated anti-anomalous unit.